The latest flash report from the UNHCR-led Protection & Return Monitoring Network (PRMN) Issues covered: 1. Fresh fighting erupted between clans in and around Marka town, Lower Shabelle on 1 August 2017 leading to displacement of 9,600 individuals. PRMN partners report that tensions remain high. 2. 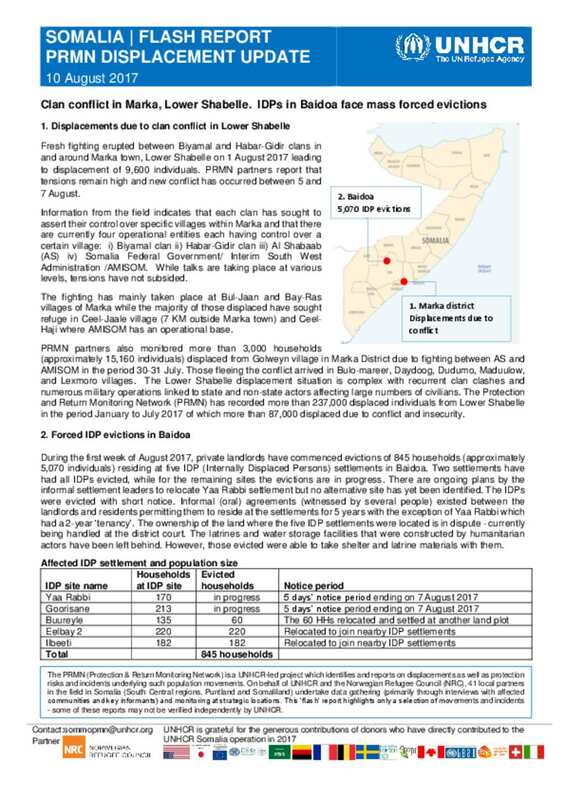 During the first week of August 2017, private landlords have commenced evictions of 845 households (approximately 5,000 individuals) residing at five IDP (Internally Displaced Persons) settlements in Baidoa.